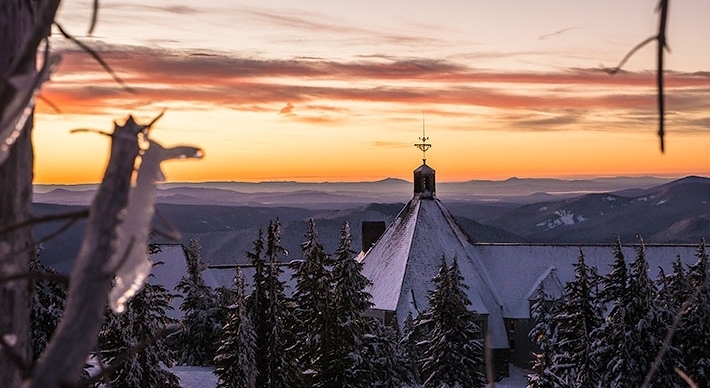 Stay the night and join us on a sunset snowshoe hike around Timberline Lodge. On Wednesday, May 1st at 8pm, stay the night and join us on a guided sunset snowshoe stroll. The hotel room package on May 1st starts at $200 plus tax and includes a hotel room for two and snowshoes for two. BOOK ONLINE or call 503-272-3410 to make reservations. 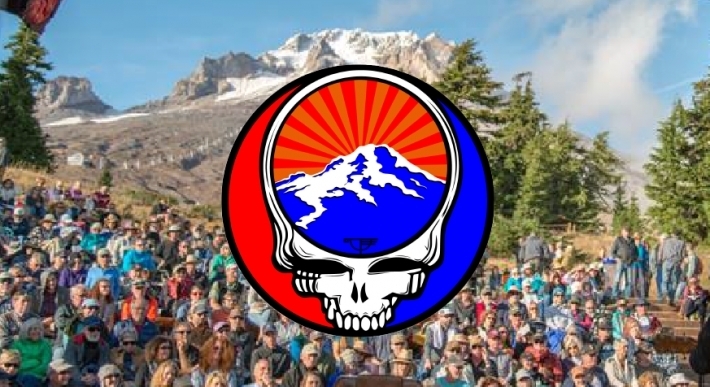 This event is reserved for hotel guests who purchased the Sunset Snowshoe Lodging Package. Wednesday, April 3 at 7pm. Meet in the lower lobby at 6:30pm. Thursday, April 18 at 8pm. Meet in the lower lobby at 7:30pm. Wednesday, May 1 at 8pm. Meet in the lower lobby at 7:30pm. Sunday, May 12 at 8pm. Meet in the lower lobby at 7:30pm. 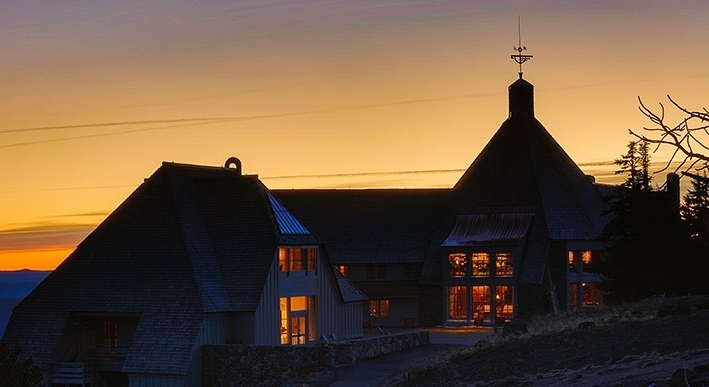 Mark your calendars now for History Happy Hour with wine, beer, and food as we celebrate Timberline Lodge's art and history at the Oregon Historical Society after hours on the First Thursday in May. 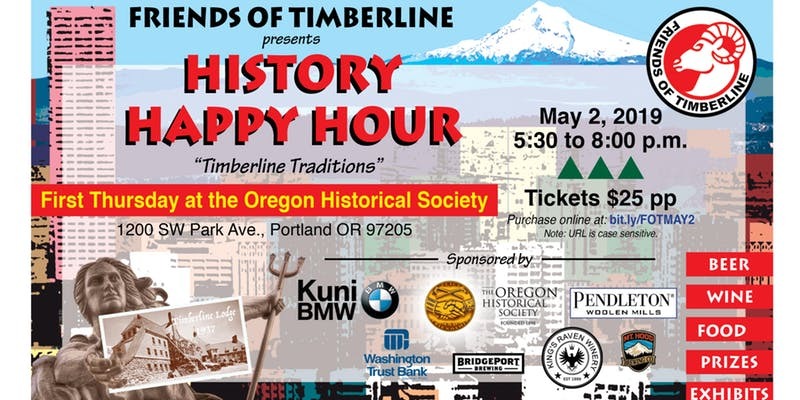 Mark your calendars now for History Happy Hour with wine, beer, and food as we celebrate Timberline Lodge’s art and history at the Oregon Historical Society after hours on the First Thursday in May! Part of your evening with you and your friends gets you a VIP look at Oregon Historical Society’s full exhibit “Barley, Barrels, Bottles and Brews: 200 Years of Oregon Beer.” Hear and see what’s up with Pendleton Woolen Mills from Pendleton CEO John Bishop, plus a rare “offsite” exhibition of artifacts from Timberline Lodge, and drawings for some awesome prizes. Timberline pass holders and email members get an extra drawing ticket to win a Ray Atkeson photo trio or a Timberline Pendleton blanket. Just bring a copy of the 4/11 email on your phone or in print or bring in your pass, and get an extra drawing ticket at the event. Continued Friends of Timberline success depends on membership, donors and corporate sponsorships. Donate to Friends of Timberline or become a member today. For more information on corporate sponsorship opportunities with Friends of Timberline click here. Timberline Lodge thanks you for continued support and we look forward to new and exciting Friends of Timberline partnerships. 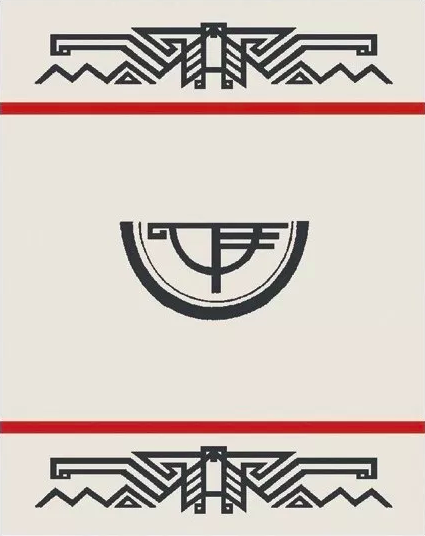 Established in 1975, Friends of Timberline, a donation based and volunteer nonprofit, is dedicated to preserve and conserve Timberline Lodge, protect its historical integrity and communicate the spirit of its builders by raising funds and coordinating community efforts to accomplish these goals. 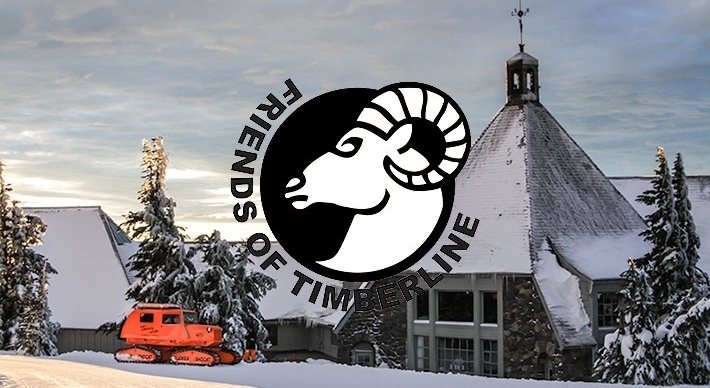 Friends of Timberline has a unique and close relationship with RLK and Company (Timberline Lodge Operator) and the US Forest Service forming a strong partnership to ensure Timberline’s future as a Living Museum and National Historic Landmark for the over two million visitors a year. Friday night May 3rd: 7pm-8:30pm “On Sacred Ground, Vinyasa & Classical Hatha Yoga for awakening Infinite energy and creative potential”: Our first practice will help us to tap into the beauty and majesty of Mt. Hood, our practice space for the weekend. This will be a powerful Vinyasa practice which will include Pranayama & Kriya practice to access the mountain base of our own spinal column upon which our infinite creative potential resides. We will work with standing poses, hip openers, kriya, breath, & visualization techniques. Saturday, May 4th 7:30-9:30am: “The Power in Your Yoga Practice”: This will be a vinyasa flow practice designed to inspire and challenge students to new levels in their practice through dynamic, fun and creative sequencing. We will work with the power of intentions and the energy of the mountain to come into full alignment with our higher selves. Saturday, May 5th 5:30-7pm “The Heart of Silence”: A Yin, Pranayama, & Yoga Nidra Practice After a day of play at the lodge, good food and friends, we will enjoy a practice utilizing classical restorative yoga poses and the breath to feel revitalized, relaxed and renewed. This will be followed by a Yoga Nidra practice, the yoga of awakening through deep yogic sleep in a lying down guided meditation. Sunday, May 6th 7:30-9:30am: “The Deep Life Force of Yoga” This Vinyasa practice will focus on Backbends, Twists, & inversions for all-levels, and bring our weekend to an inspiring close. Michele Loew is an international yoga teacher and the founder and director of The Yoga Space in Portland, Oregon. She is known as a teacher’s teacher and is respected for her 200 Hr & 500 Hr. Yoga Schools and her ability to combine Western knowledge of the body (Anatomy & physiology and modern kinesiology techniques) with the Eastern tradition of yoga. She has practiced and taught yoga since 1998, having studied extensively in the Iyengar and Ashtanga traditions as well as the Sri Vidya lineage. She is known for her keen observation skills and her ability to guide a student towards aligning the physical and energetic body through the use of expert hands on assists and intelligent verbal cues. She brings to her teaching a warm and engaging style that reflects her own internal understanding of the practice. Michele is an avid student of Eastern & Western Philosophy and continues to study with her principal yoga teacher Richard Freeman with whom she has practiced with since 2000. She has been Richard’s assistant in his teacher trainings and workshops, and has a close understanding of his brilliant middle path teaching. She practices Tibetan Buddhism, and received several Kalachakra initiations with HH The Dalai Lama and practices Vajrayana as guided by her beloved teacher in Buddhism, Dr. Robert Thurman. Michele teaches regular classes and trainings in Portland, as well as retreats and workshops internationally. Stay the night and join us for Murder Mystery Theater and a three-course dinner in the Cascade Dining Room. 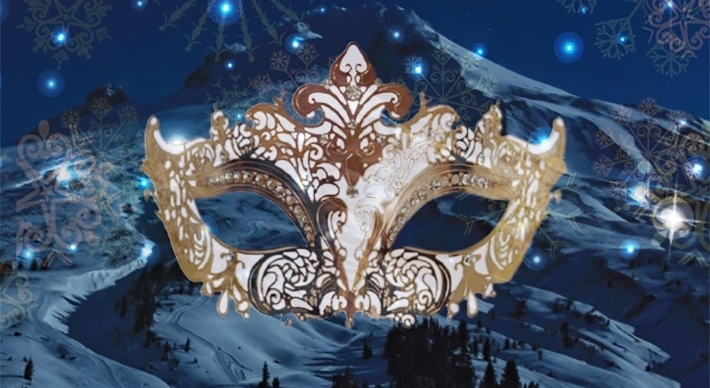 Attend the Billionaires’ Club Annual Masquerade Ball and help get this soiree back on track by trading clues with your guests, gathering information, and solving the crime before the masked menace gets away! 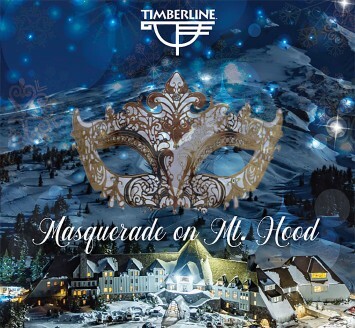 Suggested attire is evening wear suitable for a mountain lodge – think ball gowns with fur and snow boots, suits and tuxes with plaid accents, and of course a facemask or balaclava to disguise your identity. Get ready for a glamorous evening of mystery, intrigue, and murder. Masquerade on Mt. 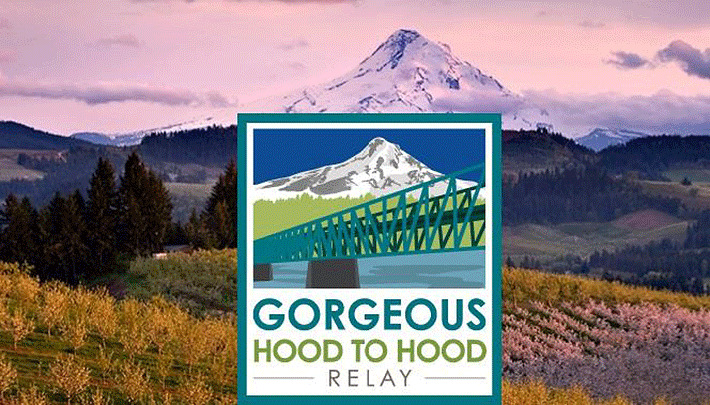 Hood packages for two people start at $280 and include a hotel room, thee-course dinner in the Cascade Dining Room, and a two-and-a-half hour murder mystery show. Guests may check in to their hotel room at 4pm, the Murder Mystery dinner starts at 6pm. On Mother's Day, stay the night and join us on a sunset snowshoe hike around Timberline Lodge. On Mother’s Day, Sunday, May 12th at 8pm, stay the night and join us on a guided sunset snowshoe stroll. The hotel room package on May 12th starts at $200 plus tax and includes a hotel room for two and snowshoes for two. BOOK ONLINE or call 503-272-3410 to make reservations. Treat your mom and yourself to Mother's Day at Timberline Lodge, featuring an elaborate brunch buffet with complimentary mimosas and activities for the whole family to enjoy. Your mom deserves the very best, and we're here to make her day and yours memorable and fun. The 2019 Gorgeous Hood To Hood Relay will be held Sunday, June 9th, from Timberline Lodge to the Waterfront Park in Hood River. 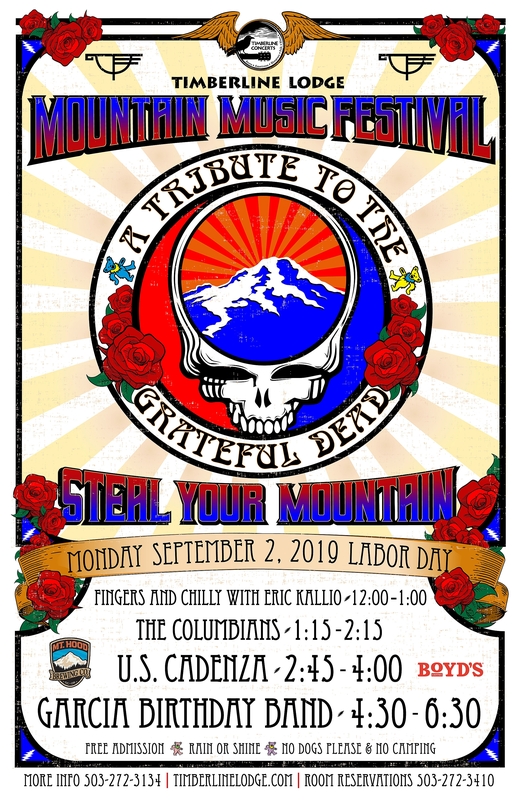 Continuing the Labor Day tradition of free live music at Timberline Lodge, Timberline to host an all day mountain music festival celebrating the music of the Grateful Dead.